So I am currently undertaking one of the many online courses Burdastyle are offering, the ‘Activewear’ course. I have been quite keen to have a go at making my own for a while now. 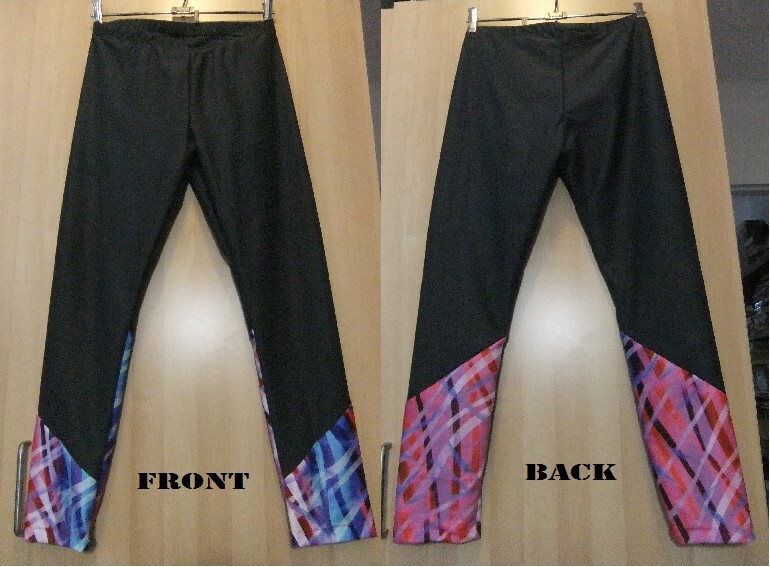 I’m especially inspired by Fehrtrade‘s range of sports gear, and her latest pattern, the Steeplechase Leggings, are pure genius. I previously bought the PBJam leggings pattern but of course haven’t made them yet! 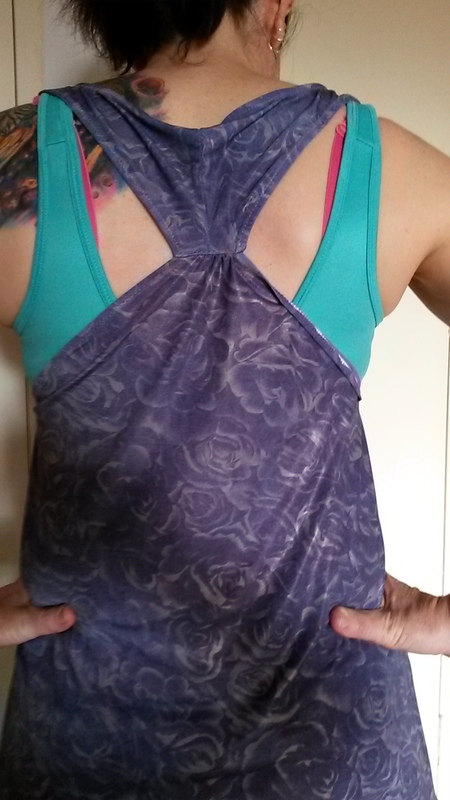 Anyway, the Burdastyle course includes slopers for tops and leggings, and video tutorials to draft and make six different articles, including a sports bra. I am quite behind but luckily we will still have access to the videos after the course is over. My first item was a running tank which was a disaster. 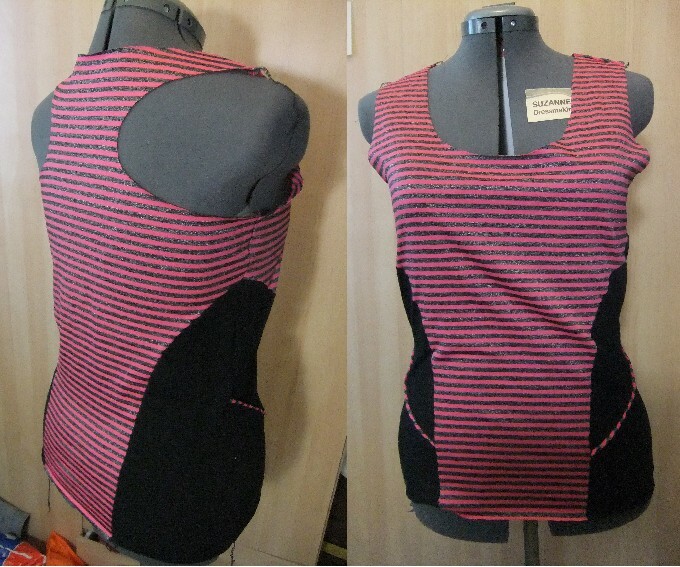 The fabric is cool, but something went horribly wrong with my draft at the back neckline there. Next there is a panelled tank and a t-shirt with some interesting design lines, both of which worked quite well. This is the t-shirt, which I made from some plain black cotton lycra, and some black animal-print stretch fabric left over from these leggings. In hindsight I should have done the sleeve panels the other way around, with the lycra at the underarm and the animal print on top, but as a totally wearable muslin (and yes, I’ve worn it already!) it’s just fine. The panelled tank worked well as far as size and fit goes, but sadly my overlocker decided that thread tension just wasn’t something it wanted to do anymore, so all my seams are going to need re-stitching. This tank is meant to have binding on the armholes and neckline, but I’ve left it off for now so I can go back and fix the seams, as I quite like the way it’s turned out. The black is more of the cotton lycra, and the stripe is something I’ve had in my stash for years – I’m pretty sure I got it on sale somewhere. 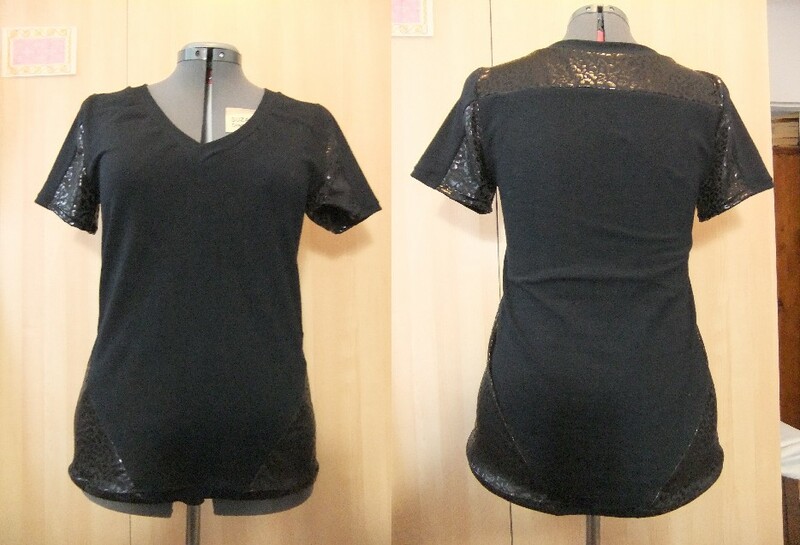 It was a similar weight and stretch as the black fabric so worked well in this top. And yesterday I finished the leggings assignment, after much hmm-hmming about the stretch factor of the fabric I wanted to use and the stretch factor required by the pattern. It looks black, but it’s actually a dark-ish grey. I used a polyester lycra for the main fabric, and the contrast is some random stretch fabric I picked up in an opshop ages ago. I’ve no idea of the fibre content (apart from it being man-made, that is.) I’ve still got about 2.5m of that contrast fabric so be warned, you may see more of it being used for stretch muslins!! The leggings fit okay, probably a smidge tight in the thigh (and definitely a bit loose in the ankle) but I will give them a test run this week and see if they are wearable. I don’t want to give too many details of the course content as I believe they will be offering it again in the future. I’m only halfway through but I have learned quite a bit about pattern drafting, as well as many handy tips for sewing with stretch fabrics. Stay tuned as there are a couple more garments to go in the course! The very limited time frame to do the course instead of lifetime access makes this a no go for me. If there ever have a doable time f are, I am in. Hey Mary! With the Burdastyle courses you get lifetime access to the resources (videos & downloads) once the course schedule is over. During the scheduled timeframe you also get realtime access to the instructor, and access to a messageboard to connect with other students. I believe you can purchase this course as an ‘on-demand’ only too which is the resources only (slightly cheaper than the realtime instructor-led course). I did not finish the course within the realtime schedule, either, by the way!